Choosing the right fence material makes all of the difference when it comes to ensuring that your fence meets your needs, fits your budget, and is in line with the amount of maintenance that you want to perform. Choosing the right fence material makes all of the difference when it comes to ensuring that your fence meets your needs, fits your budget, and is in line with the amount of maintenance that you want to perform. What types of fence materials are available and what type of fence material is right for you? Aluminum fencing is one of the best and easiest to maintain types of fencing. It is not ideal for high security fences, but it is perfect for people who don’t want to take the time to maintain their fences. Aluminum fencing is also very cost-effective, making it a great option for people who need a pet fence but don’t have much to spend. Wood fences are the most popular fence material throughout the country. Wood fences are great for a variety of types of fencing, including privacy fences, decorative fences, and pet fences. The white picket fence is still one of the most idyllic symbols of home ownership, so wood is a great starter fence. Unfortunately, wood fences require a great deal of maintenance. They need to be stained or painted to protect the wood from insect infestation and wood rot. 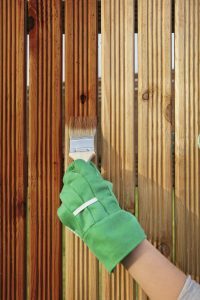 If you don’t take the time to maintain your wood fence, you will need to replace it relatively soon. Wrought iron is a perfect fence material for people who want to do something different with their fencing. Wrought iron fences require a great deal of maintenance, but they are very strong and good for protecting your home. Wrought iron fence material should be sanded, repainted, and maintained every 2-3 years. Wrought iron fences can also be much more expensive than other types of fencing.